Just over a week ago, as the EU Twittersphere was starting to turn its attention to the EPP’s Dublin Congress, I wondered what presence – if any – Jean-Claude Juncker had on Twitter. None was the answer. 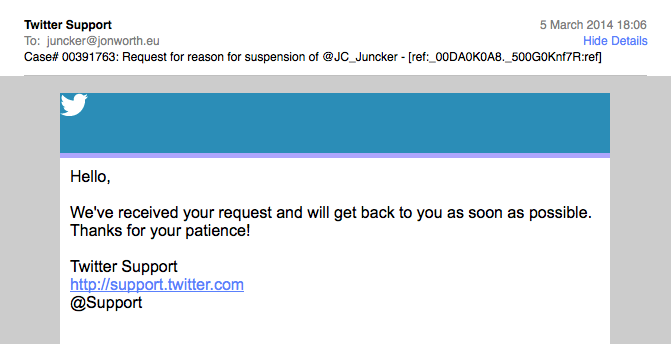 So on 2nd March, at 2117 CET, I registered @JC_Juncker, a spoof Twitter account. 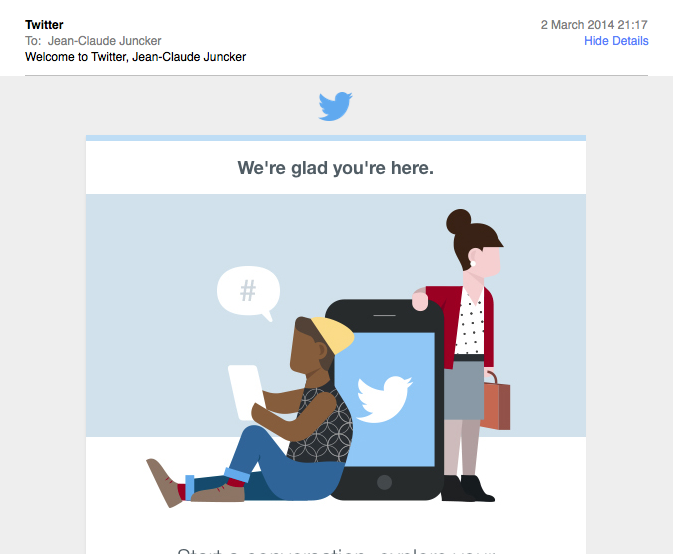 This screenshot of the confirmation e-mail from Twitter confirms the time of the registration. The screenshot is from Tweetbot on my iPhone, but you get the idea. 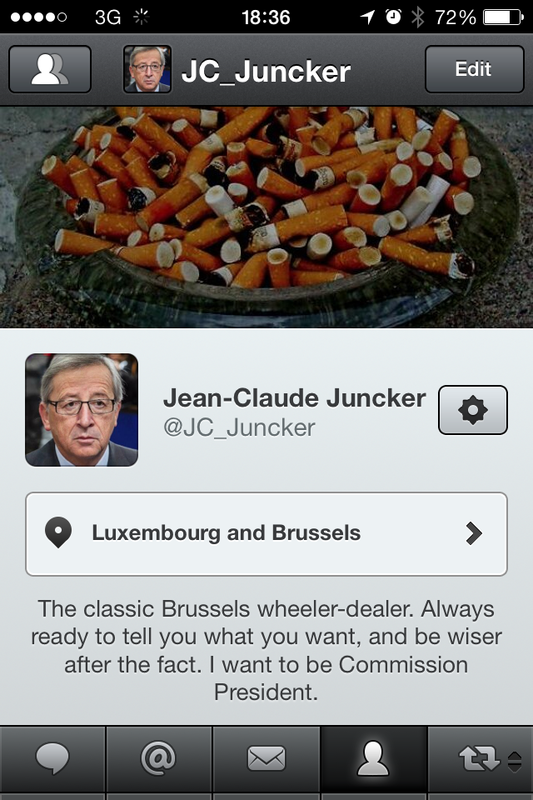 The cover picture is an overflowing ashtray, alluding to Juncker’s well known smoking habit. The biography is clearly not serious. This is obviously not an official account – it is a spoof. So then, just over 2 days after creating the account, and having followed 800 people, and having amassed 300 followers, the account was suspended by Twitter on Wednesday 5th March, sometime in the late afternoon, and remains suspended. I do not know when exactly the account was suspended, as I received no e-mail notification of the suspension. I filled in the form on Twitter’s website as fast as I could, requesting the suspension be overturned (screenshot of the e-mail confirming this request was submitted is here). Since then I have heard nothing from Twitter. The account, I admit, does not fully comply with Twitter’s parody policy, but I have had no opportunity to add “parody” to the username to make it clear the account is not real as Twitter would demand. Further the account has now been suspended for more time than it was actually running, and this leads me to smell a rat – how did someone manage to get the account suspended so fast, while I am still awaiting a response from Twitter to my appeal? The Twitter parody page very clearly states “We process complaints in the order in which they are received” – in this case this has clearly not been respected. Does the fact that Twitter had a stall at the EPP Congress in Dublin have something to do with it I wonder? Does having the right connections to Twitter allow you to bypass the official policy? If we are to trust Twitter as an impartial platform for political communications then it should not be possible to use connections to bypass the policy – I do hope this is just an oversight from Twitter in this case. I will update this post once I know more. Interesting that Google still lists your account above the official one.